The new GS node editor is progressing nicely and everything seems to fit. I have data visualization for most types of streams with scopes and FFTs and yesterday I added a map widget to visualize the GPS ECEF location. I’ll start from the end – the PIGPIO sink. This takes a PWM stream from the Throttle To PWM node which does exactly what the name says – converts a throttle stream into a PWM stream. 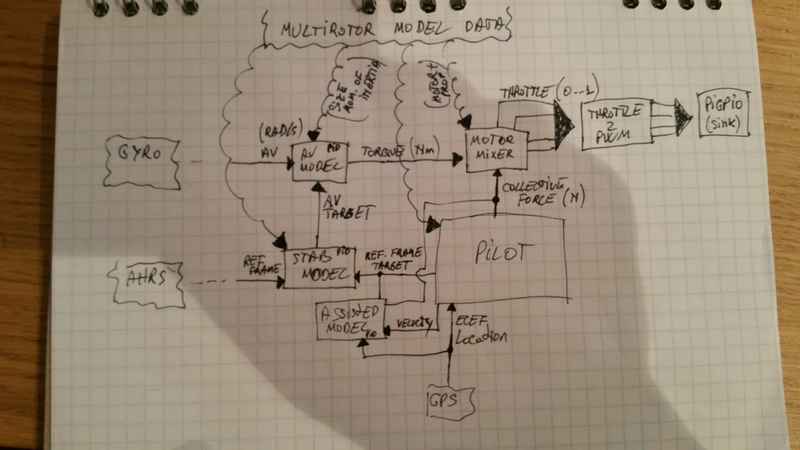 The Throttle stream comes from the motor mixer which uses data from the Multirotor Model Data node (top cloud) to convert a Torque stream and a Force stream into throttle values for each motor. This conversion can be done easily for a certain combination of motors + propellers. It doesn’t have to be very accurate as there are some PIDs before this to compensate. The Torque stream is calculated by the AV Model node (renamed now to Rate Model) that basically combines a rate PID + a feed forward model using again the top cloudy model data. It takes as inputs an angular velocity stream from the gyro and another angular velocity target stream from the Stability Model and tries to match them. The corrections represent the Torque stream. The Stability Model node is responsible for matching a given Reference Frame (from the AHRS node) with a target ref frame from the Pilot or Assisted Model Node. The output of the Stability Model Node goes into the Rate Model Node. The Assisted Model Node is responsible for matching a stream of velocities from the GPS with a target velocity from the Pilot. The velocities include both horizontal and vertical (altitude) components. It’s used to model a very intuitive control scheme – move left at 1m/s, or climb at 2m/s. Its outputs are a ref frame stream for the Stability Model (which will try to match it) and an up force stream fed into the Motor Mixer Node. The Pilot Node interprets RC inputs (not shown in the diagram) and outputs either a ref frame + up force stream when using rate/stab controls, or a velocity stream when using an assisted control scheme. – The Stability Model reads orientation data and tries to match it by rotating the quad. It uses a stab PID to do this (until I have a good FF model). – The Motor Mixer reads torques and figures out what throttle each motor should have based on the geometry of the quad and power train. So far this looks like it should work.